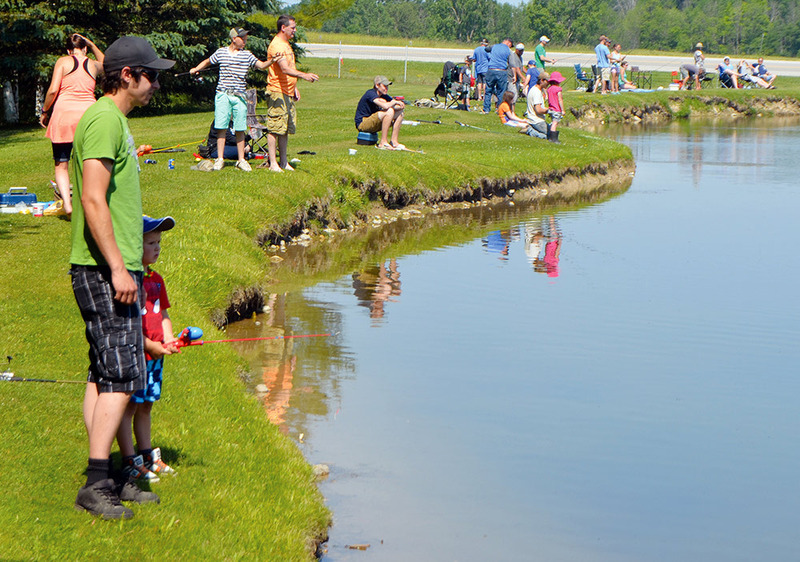 After 29 years, the annual Father’s Day fishing derby event held at Scrimgeour’s pond south of Blyth has come to an end. The cancellation was announced last week by host Doug Scrimgeour who said that volunteers are getting difficult to find and the event was a taxing one to host. He and his wife Diane Radford, alongside the Blyth Legion and Legion Ladies Auxiliary, hosted the event annually for 28 years, with last year’s iteration being cancelled. Scrimgeour said getting the property ready was laborious and the Blyth Legion and Legion Ladies Auxiliary did a significant amount of work to pull the event together. Scrimgeour said the event, which started as part of the now-defunct annual Blyth Rutabaga Festival, was something he and Radford enjoyed doing. He said that, over the years, many people have touched base with him saying that the derby was their first time fishing and led to many years of angling. Scrimgeour said that, every few years, the pond was restocked with 500 fish at a time with non-spawning fish. He said the pond has always been healthy and the fish survive well on their own, which was what made it a great place to host the event. Over the years, Scrimgeour calcualtes more than 5,000 fish have been deposited into the pond, and that the price per fish has tripled or quadrupled over the last 29 years. The cost, however, was always worth it when he saw the children’s faces after they had landed the big fish. Scrimgeour said he hopes that the event can live on elsewhere, saying that there are great fishing spots for families to visit in the area, including the Blyth Creek which has recovered over the years thanks to the efforts of community members. Legion member and long-time derby volunteer Donna Govier said the event not going forward is a loss for the community, but that she understands why it happened. Between the Legion and the Legion Ladies Auxiliary, a dozen volunteers would be involved in the event annually, and the Legion would spend $500 to $700 renting the port-a-potty for the day and buying the food that the Auxiliary would then cook for the participants. Govier said that she is “a softy” when it comes to events that are for children and that’s why she’s been involved with the derby since it began. That year, there were trophies for the winners in each category, however she said she wanted to make sure every child left with something to remember the day by and instead got awards for everyone. She has great memories of the event, saying she has photos from most years and fondly remembers her own family participating. Like Scrimgeour, she hopes that the event, or something similar, can take its place, but that would require finding a suitable space. She said that alternative locations had been considered previously, however, the traditional location offered a unique mix of shallow water and a smaller size, enabling a safer environment. “When you have 90 to 100 kids coming out, you can’t be too careful,” she said. “You have to watch and have to have water shallow enough that people aren’t going to be in trouble if they fall in.